Unofficial accidental “time” theme this week. Also charts! “GlitchPEG is perhaps the first screen saver that’s excellent at detecting buffer overflow exploits.” XScreenSaver 5.4 is out. On the Virtues of Terseness. Time makes us crazy, part 2: Higgins Time. Time is poorly defined even now, part 3: [tz] Mozambique officially uses LMT? Related: Technical Papers Preview: SIGGRAPH 2018. The Curta Calculator, which I’ve mentioned before. I should have linked this yesterday: a description of kcollect and its uses from Matthew Dillon, complete with example graph of a very busy machine. There’s a new facility in DragonFly: kcollect(8). It holds automatically-collected kernel data for about the last day, and can output to gnuplot. Note the automatic collection part; your system will always be able to tell you about weirdness – assuming that weirdness extends to one of the features kcollect tracks. Here’s some of the commits. Introducing anvil – Tools for distributing ssl certificates, plus examples of usage on FreeBSD. OpenBSD on the Huawei MateBook X. Add vmctl send and vmctl receive. BSD Pizza, a meetup in Portland, Oregon, on the 27th. Sepherosa Ziehau went to AsiaBSDCon 2017 and gave a talk on his work with DragonFly’s networking. He’s published a report of his trip, which comes with a link to his paper, his presentation, and pictures of who he met. Note that the PDF and the Powerpoint slides links are different; one is the paper, one is the talk. The Powerpoint slides contain the benchmarks linked here in comments, previously. In what can be described as perfect timing, Sepherosa Ziehau has produced a document comparing FreeBSD, several different Linux kernels, and DragonFly, for networking. He’s presenting it in the afternoon track of Day 3 for AsiaBSDCon 2017, starting later this week. 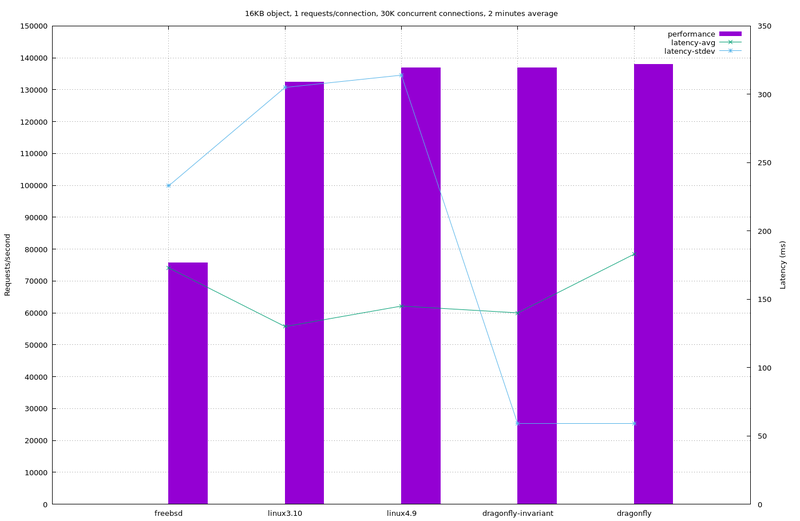 Those graphs are available standalone, too, which means it’s easier to see the fantastic performance for latency – see the thin blue line – that seems exclusive to DragonFly. That, if anything, is the real takeaway; that DragonFly’s model has benefits not just to plain speed but to the system’s responsiveness under load. “My CPU is maxed out cause I’m doing a lot of work but I hardly notice” is a common comment over the past few years – and now we can see that for network performance, too. I had too many links for this as early as Tuesday. @Play 84: The Rescue of Meta-Zelda. Randomized Roguelike Legend of Zelda is a somewhat crazy, exciting concept to me. There’s a third game in the Infinite Space series out – Sea of Stars. The first game is one of the best space-theme roguelikes out there. I didn’t even notice, because this has been a difficult week for me, but I’ve hit over 6,000 posts on the Digest. I passed the 11-year mark too, a few weeks ago. Wee Ada Lovelace. From a wee series, though this is the only computer-related one. In a weird coincidence, the person who wrote that last link, Garrett Wollman, used to be a FreeBSD core team member and also knows a former coworker of mine, Scott Fybush. No point, just a strange connection when a faceless web page on the Internet resolves into someone you know indirectly through other channels. Breaking Madden: Jadeveon Clowney’s quest for 201 sacks in a game. I’ve posted links to prior gamebreaking attempts by this author before. I like how he’s doing his best to subvert the digital world presented by the game.